Elisa is the chosen one. But she is also the younger of two princesses, the one who has never done anything remarkable. She can't see how she ever will. Now, on her sixteenth birthday, she has become the secret wife of a handsome and worldly king—a king whose country is in turmoil. A king who needs the chosen one, not a failure of a princess. And he's not the only one who seeks her. Savage enemies seething with dark magic are hunting her. A daring, determined revolutionary thinks she could be his people's savior. And he looks at her in a way that no man has ever looked at her before. Soon it is not just her life, but her very heart that is at stake. Every book I read leaves an impact in some way or another on my life. Some mediocre. Some bad. Some good. Some thought-provoking. Some light-hearted. Some inspiring. Every once in a while, though, a book comes along that blows away all the others. A book that makes you laugh, makes you scream, makes you cry, makes you vomit from heart-brokenness, makes you die a little bit on the inside, makes you happy, makes you sad, makes you scared, makes you angry, and makes you fall in love. 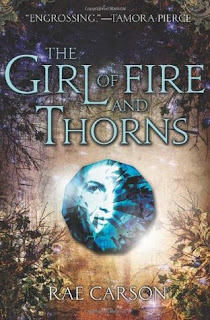 The Girl of Fire and Thorns is one of those books. Many books have made me cry, even if just a little, over the course of my life. I've read exactly three books, however, that have evoked enough emotion to force me to curl up into the fetal position in my closet and bawl for 20 (or more) minutes, shaking from head to toe. I could say so much about any of these books. I could talk about how the characters are emotionally-attaching, or how they’re strong, or how heartbroken they leave you. I could talk about how well-written they are, or how wonderful the plot is. But, in all honesty, these books evoke so much emotion, that there’s no way to describe them other than for you to experience it yourself. So, this review is going to be short and sweet, because I just don’t have much to say. Or rather, I have far too much to say, and I can't possibly fit it all into one post. "The beauty of the night sky offers strange comfort. It is unchanging. Immune to the wars of this world. Something to count on." "...makes you vomit from heart-brokenness" Oh yes, I need this book now. My heart needs for fracturing. I've just nominated your blog for an award!